Fall 2012 brought cooling water temperatures and a nice break from the heat and humidity of summer. 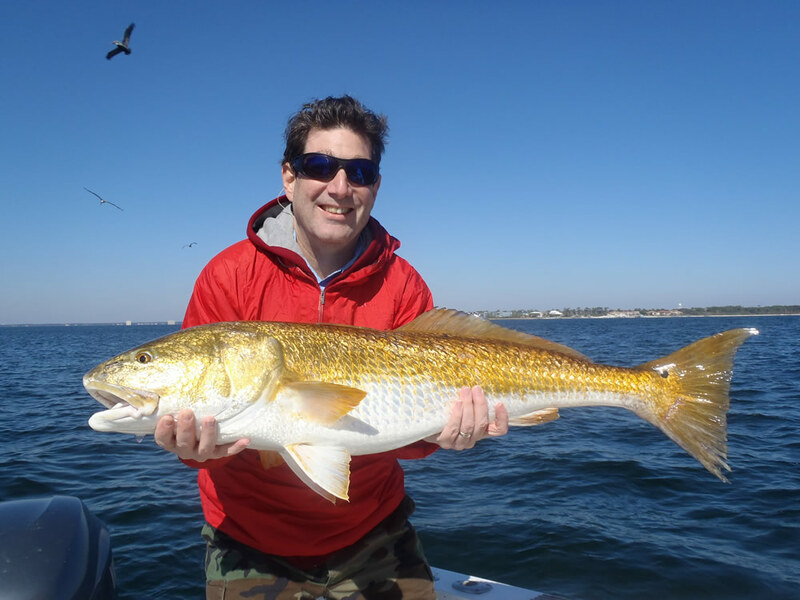 The fish start to move as the water temperature drops. 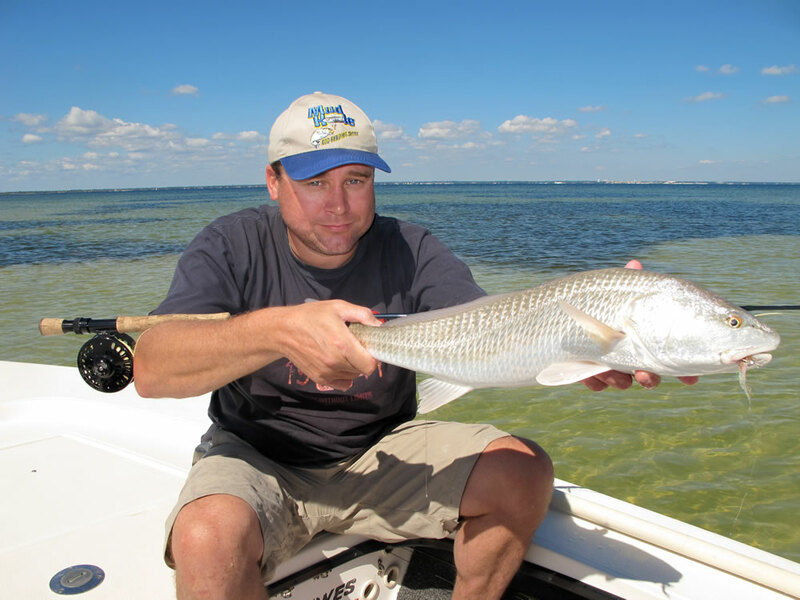 Redfish come up from the cooler depths into water shallow enough for sight-fishing. 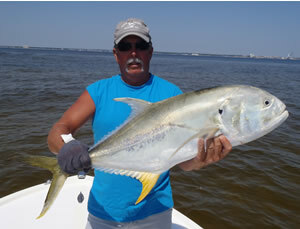 Jack crevalle which have been in the bay system all summer begin their move to the Gulf of Mexico. 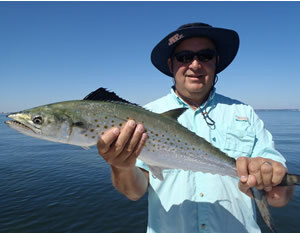 Huge Spanish mackerel become very active on the grass flats of Santa Rosa Sound. 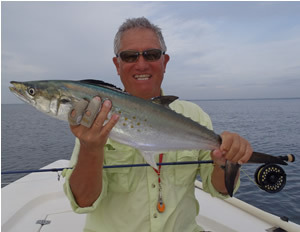 Ladyfish depart making it easier to pompano fish along the edge of the Gulf, and the false albacore return. 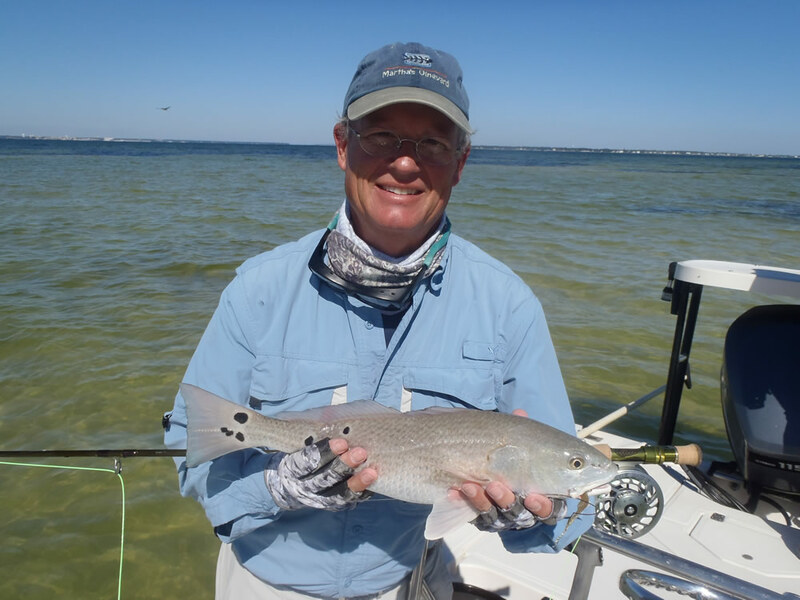 Big trout start showing up on the flats, too, plus there's always good catch-and-release bottom-fishing for red snappers and groupers. In late-October we watch for the "Running of the Bulls", and this year the amazing phenomenon began October 27 and continued throughout November. Scroll below to Oct 27 for a short video capturing the action. 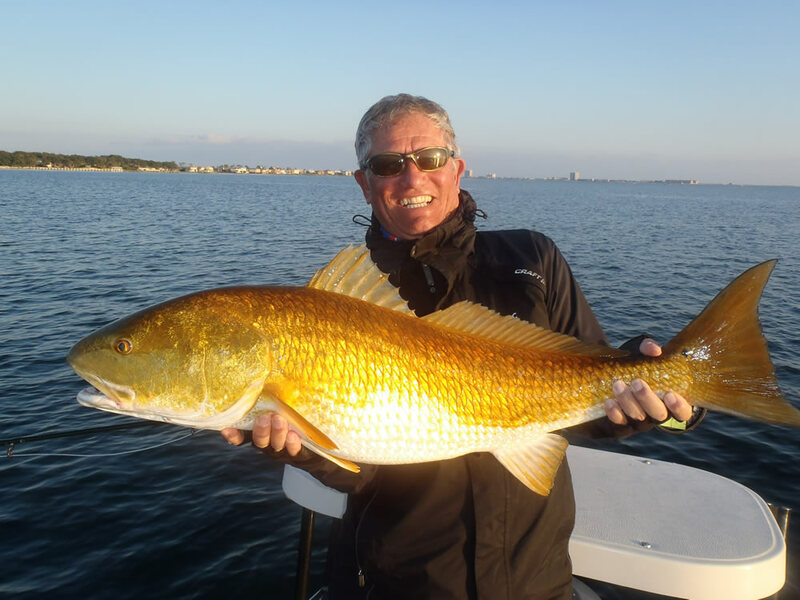 When the big redfish in bright-orange spawning colors start crashing baitfish on the surface it's hard to focus on anything else. 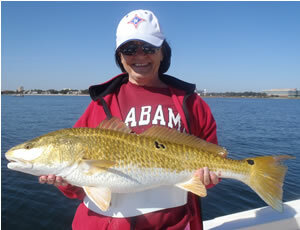 For photos from previous seasons, check out these additional galleries: Spring 2012, Winter 2012, Fall 2011, Summer 2011, Spring 2011, Winter 2011, Fall 2010, Summer 2010, Spring 2010, Winter 2010, Fall 2009,Summer 2009, Spring 2009, Winter 2009, Fall 2008, Summer 2008, Spring 2008, Winter 2008, Fall 2007, Summer 2007, Spring 2007, Winter 2007, Fall 2006, Summer 2006, Spring 2006, Winter 2006, Spring 2005, Summer 2005, Fall 2005. Use the back button on your browser to return to this page. For the third year in a row Casie and Wade Knight from Tigertown, TX, kick off the fall photo gallery. 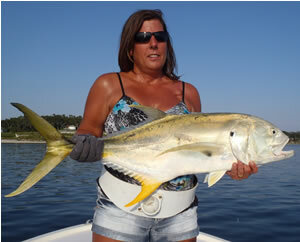 Casie coaxed this jack crevalle to crush a topwater "chug bug" and brought it to the boat about twenty minutes later. 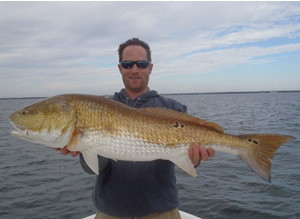 In similar fashion Wade had his hands full with this 25#plus beast...again on a 4 1/2" chug bug. You just don't "know jack" until you feel the power of these incredible fighters. 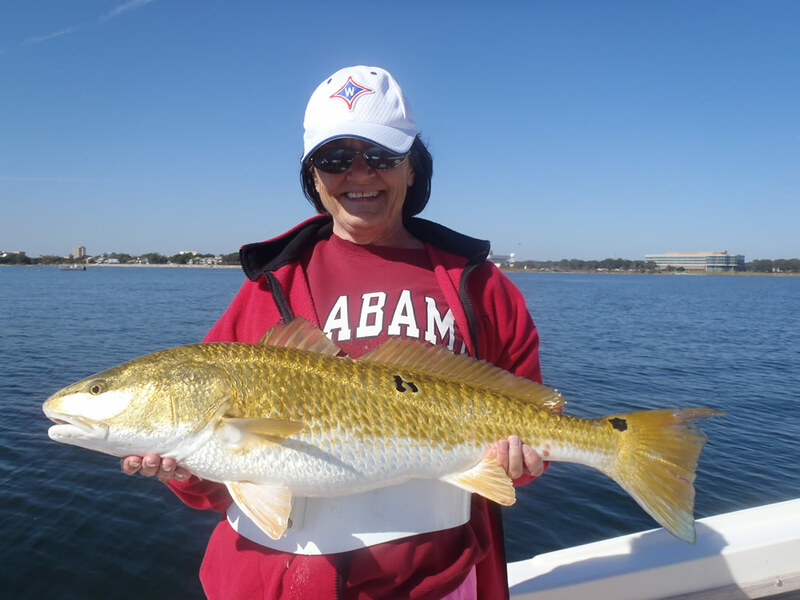 Pam and Sandy Loveless came to town September 27 and found the redfish ready to play. 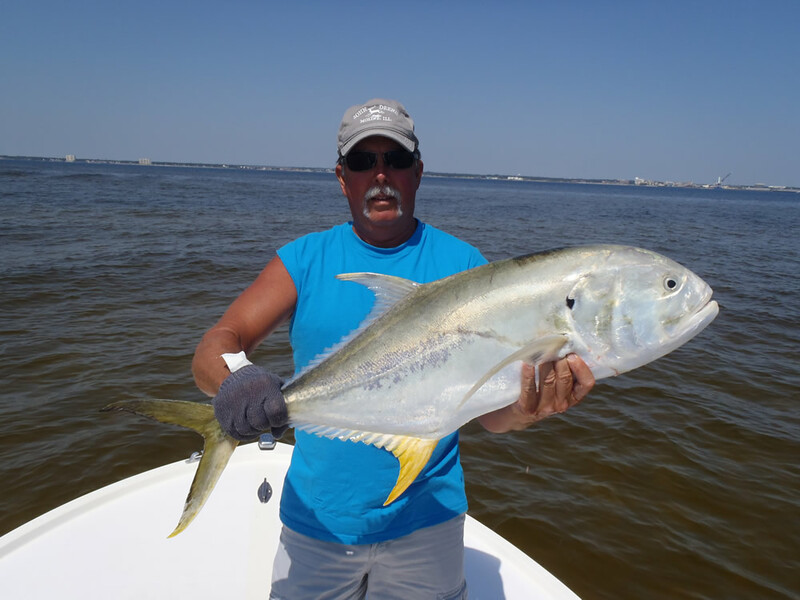 This perfect slot-sized fish played its way right into the cooler. 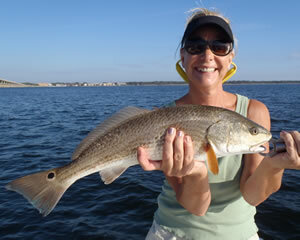 Sandy added this second redfish to the take, and they were ready to fire up the grill. 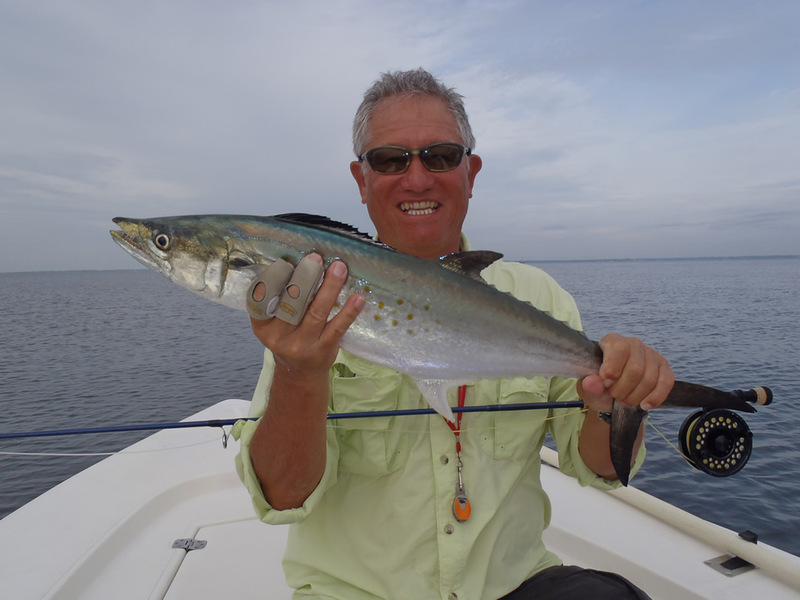 London's Mike Youkee was blind-casting for big Spanish mackerel on September 28 when a school of about fifty jacks exploded on the surface close to shore chasing baitfish. 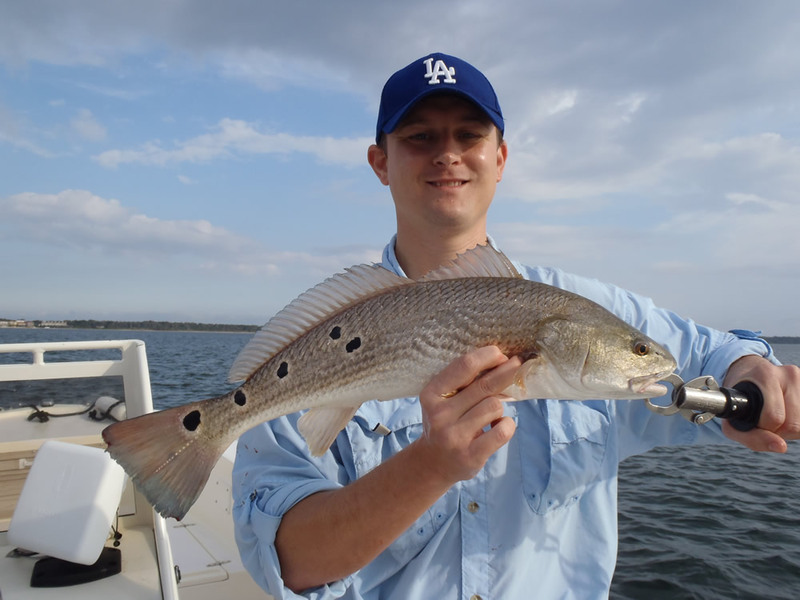 The water was so shallow the fish's backs were out of the water. 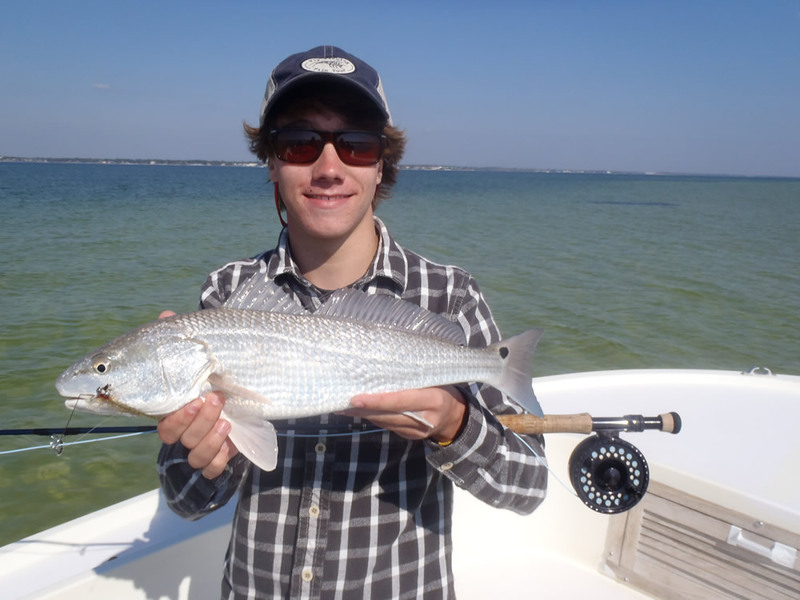 We unclipped the anchor, grabbed the 10wt, poled into range, and Mike fired one of Ben Walters' 2/0 poppers in front of the school. A half hour later we took this photo and released the fish unharmed. While Mike was fighting this jack a school of big redfish came to the surface a few hundred yards from the boat, but of course we were somewhat busy... By the time we landed the jack the redfish were gone. That's fishing for you. 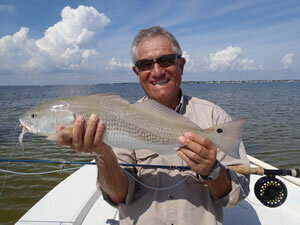 We spent the next few hours hunting redfish of this quality on the shallow sand/grass flats of Santa Rosa Sound. 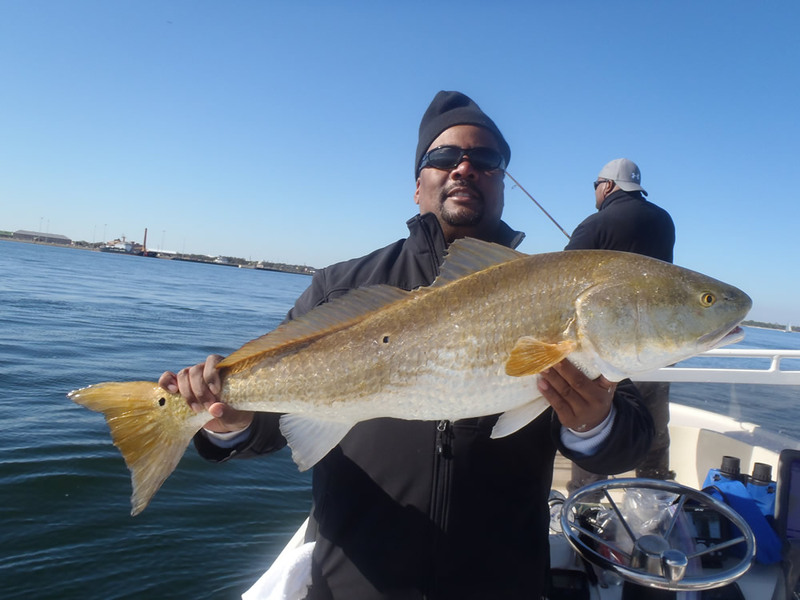 He hooked up immediately and the fish took off like a FA. No problem on a 9wt, right? 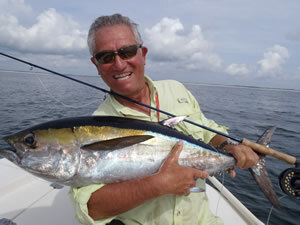 Then we saw more of the big boils around the boat and realized they were blackfin tunas! 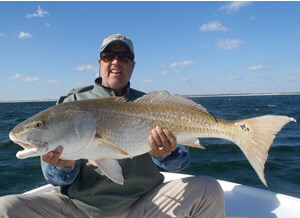 Mike's fish had the 9wt doubled over, and we began to realize this was more than a FA. 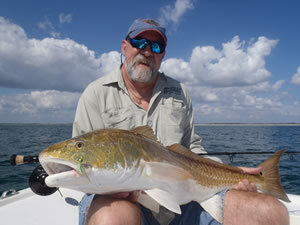 We never cranked up the motor, and Mike deftly battled the fish palming the spool to apply as much drag as possible. 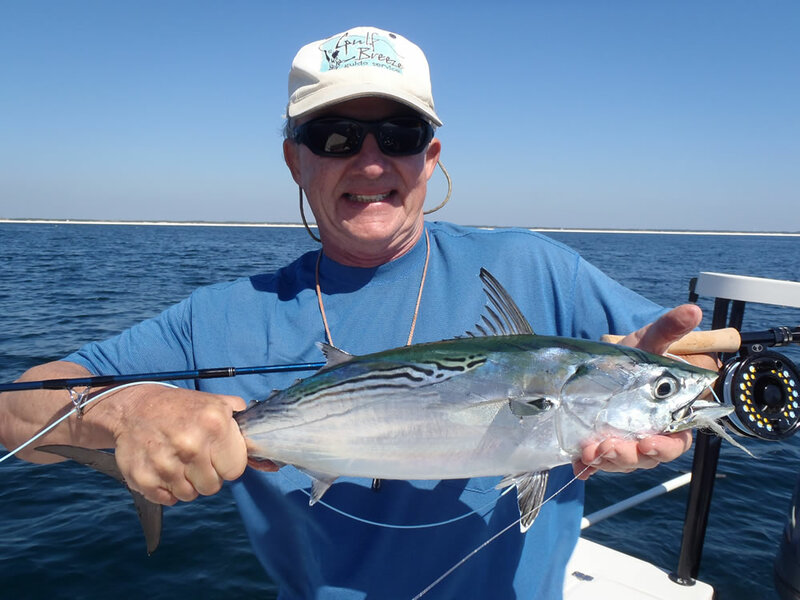 The blackfin could've spooled Mike in a heartbeat, but it was like it never realized it had a problem (which it really didn't!). 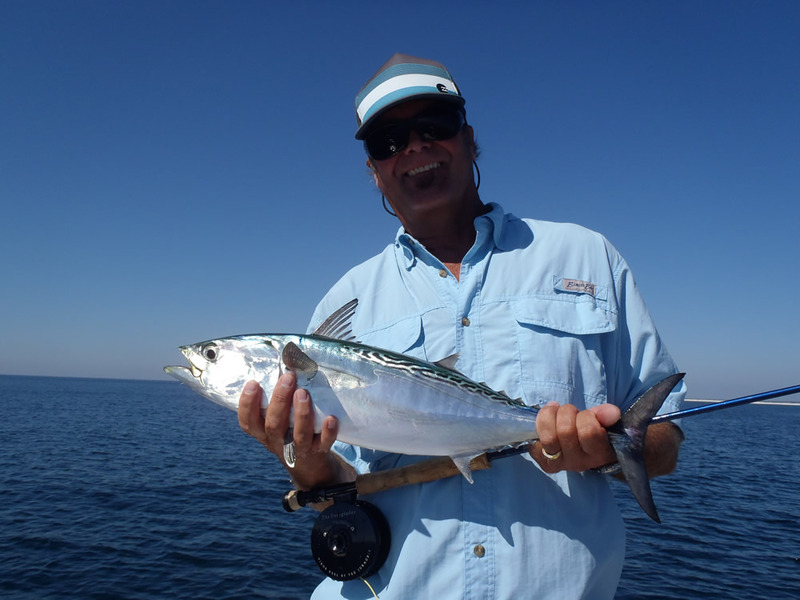 Mike coaxed the fish slowly toward the boat, and as it got close we could see the incredible iridescent lavender of the blackfin tuna. You'll never see a more beautiful fish in the water. 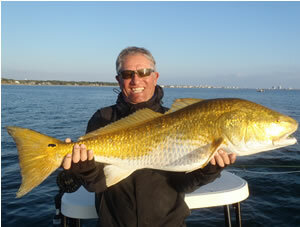 We estimated the weight at 25#, took these two photos, and released the magnificent specimen to fight another day. 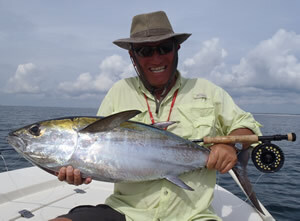 The tuna was docile in Mike's hands for the photos and then simply swam away. The whole experience was pure magic. Hearty congratulations to Mike Youkee for landing our first-ever blackfin tuna on fly. The blackfin tunas and sailfish hung out within 2 miles of shore for the next couple weeks, but they relocated about 20 miles to the east around Navarre Beach. On October 10 Rocky Sleight and Greg Speer (Rocketman) went looking for them, but all we could find were hundreds (thousands?) 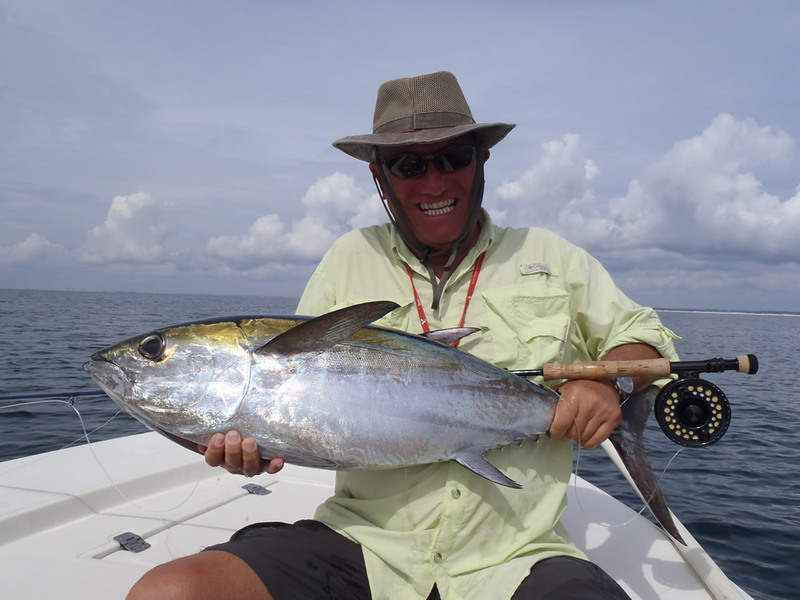 of false albacore. Oh what a problem! 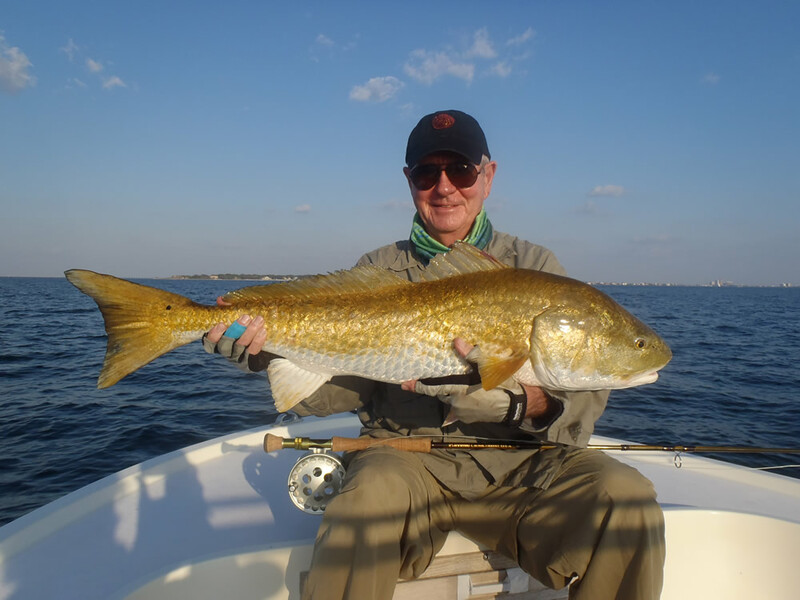 The fish were finicky as ever, but Rocky broke in his new 8wt by landing this FA on a #6 clear gummy minnow fished on a dead drop. 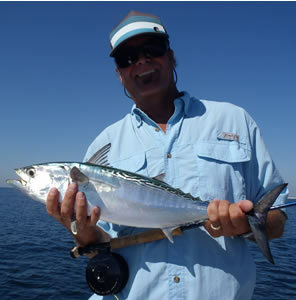 Rocketman followed suit and landed this albie on a new baitfish pattern tied with EP fibers by Karl Elliott. 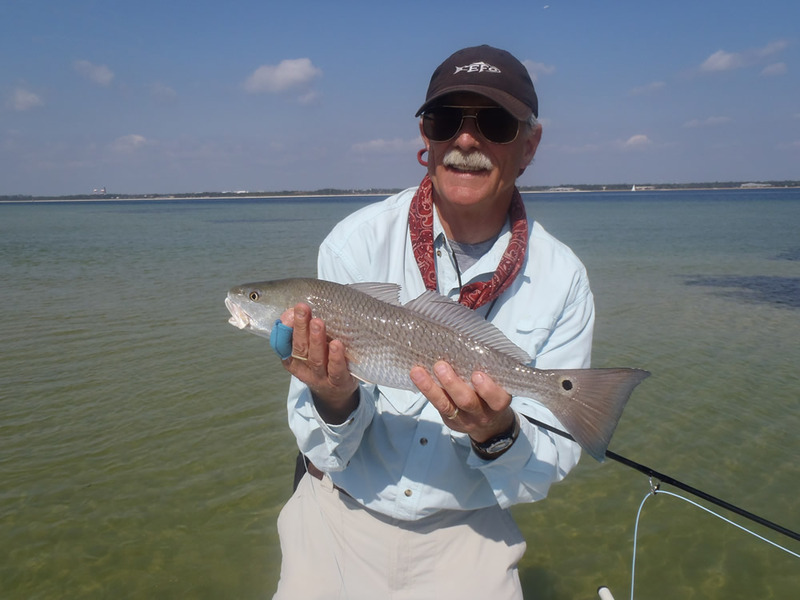 Rocket spent the next day chasing slot-reds on the flats. 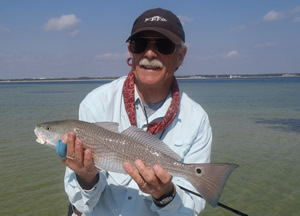 A #2 tan/white EP clouser was the hot fly that day, and Rocket was "The Man" after making a perfect 90' cast to this fish. It was beautiful standing on the platform watching the loop unfurl and the fly drop 6' in front of the fish. Impressive casting for sure. 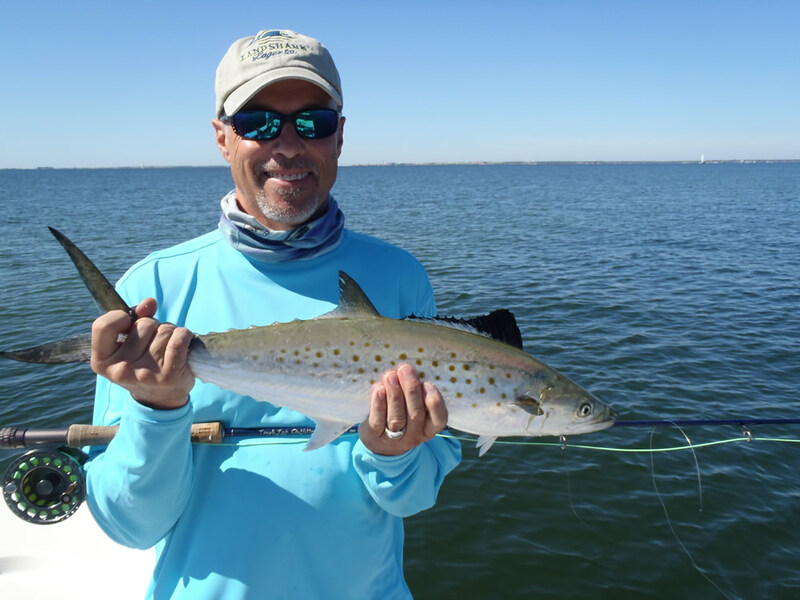 Jamison Griffin was impressed October 12 when this Spanish mackerel (his first) smoked his clouser minnow and streaked away with the fly line sizzling through the water throwing a 6" roostertail. 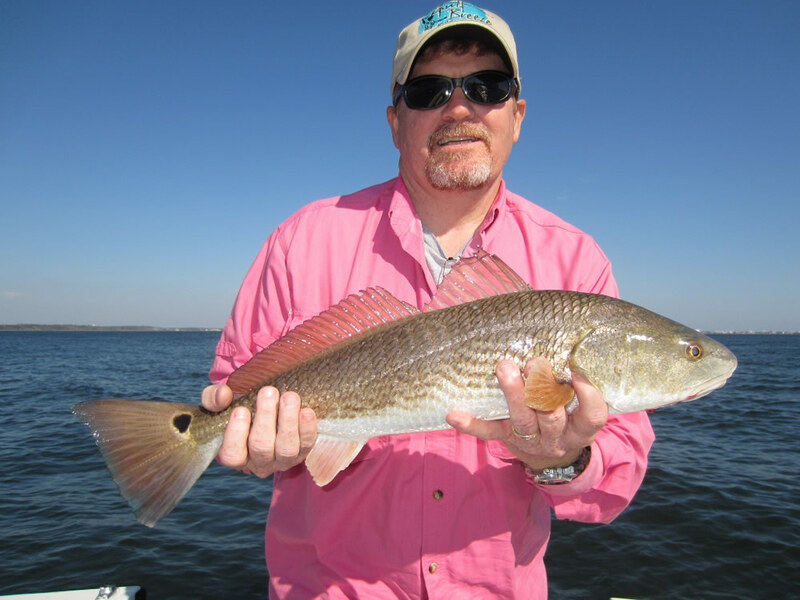 John Boles brought some fishing buddies down from Auburn/Opelika on October 15, and the slot-redfish were hungry. 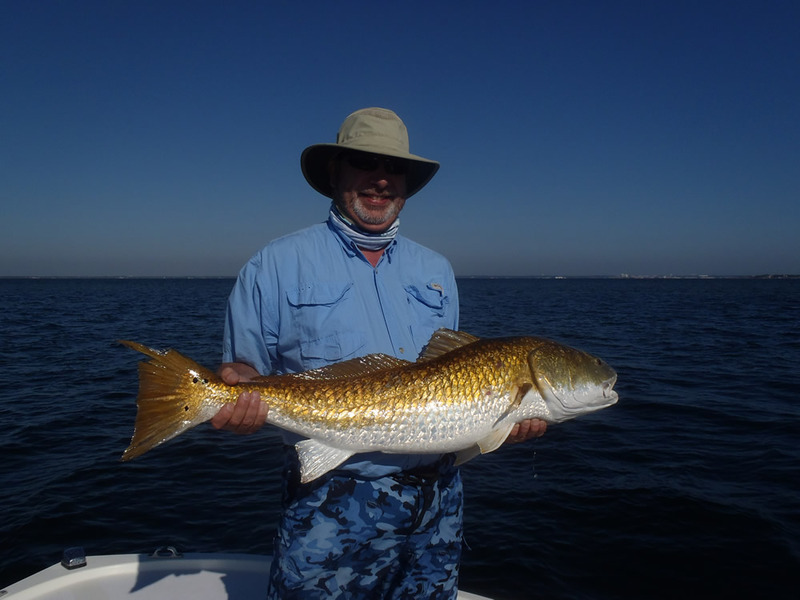 Here's a typical catch landed on ultra-light spinning tackle freelining live shrimp around structure in Santa Rosa Sound. 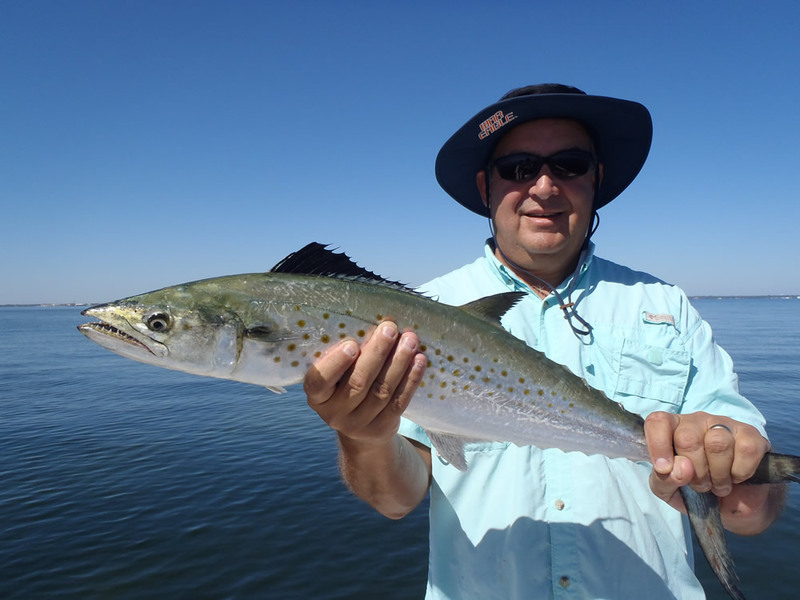 On October 17 Floris van den berg from The Netherlands found this spectacular speckled trout on the same flats as the redfish. 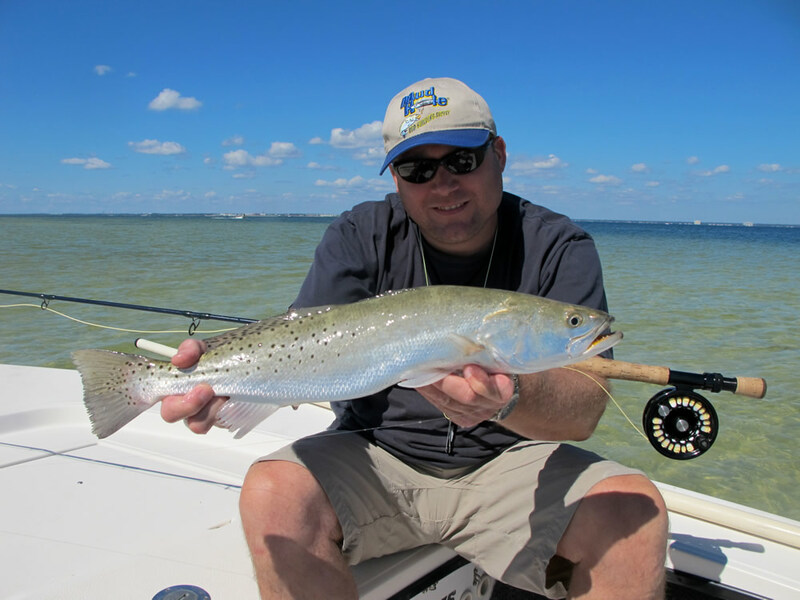 The trout took a tan/white clouser minnow tied with EP fibers. The mackerel disappeared the following day, so Tom Blair and son Lute spent the morning sight-fishing the flats for some very spooky redfish. 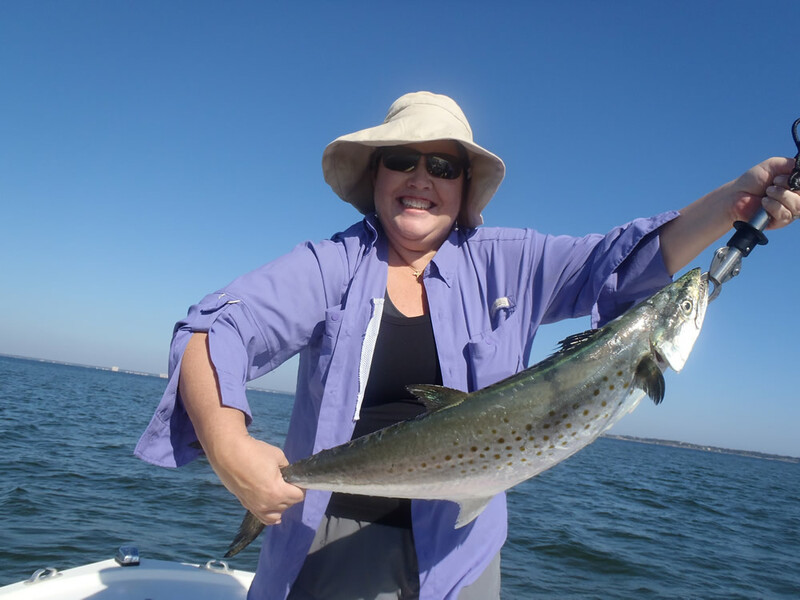 Amy Talboy on October 24 with one of the biggest Spanish mackerel of the year. 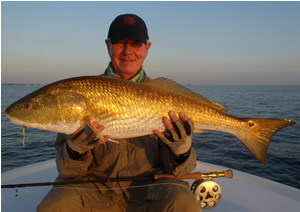 This slab-sided fish weighed 8# on the bogagrip! 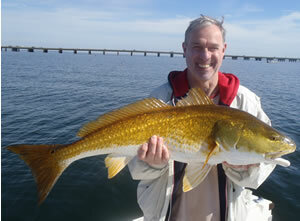 The next day Phil landed this beauty in Pensacola Pass. 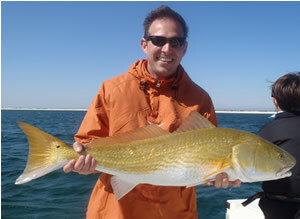 Phenomenal color difference between this fish and the one from the previous day. Not a bad way to start! 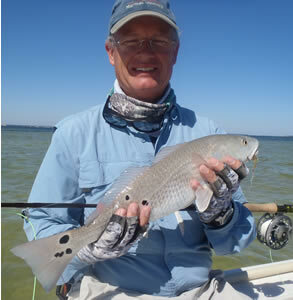 Jay Bond on October 26 with his first-ever redfish on fly. As we headed out of Pensacola Pass we saw a cloud of birds just outside the outer bar a quarter mile to the east. 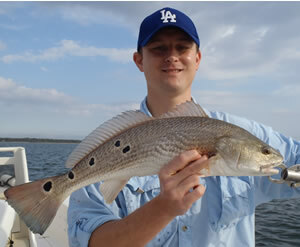 We ran over there and found a school of redfish sporadically coming to the top. Every time we got close the fish spooked and dove. 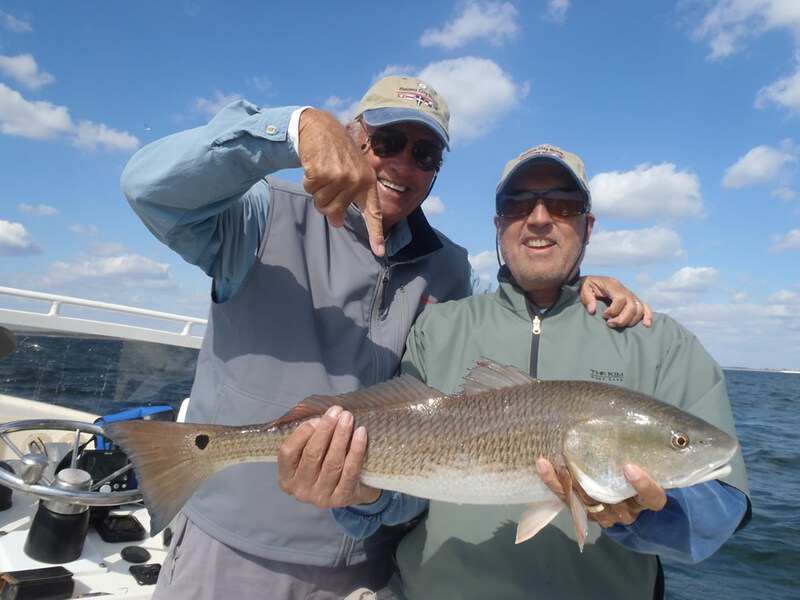 After a frustrating 45 minutes we finally got the timing right, drifted into range, and Jay put the fly on target. 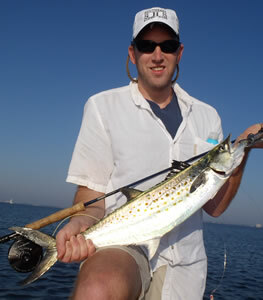 After a half hour battle on a 9wt Jay brought the fish to the net. Double click on the photo for a standard side view. 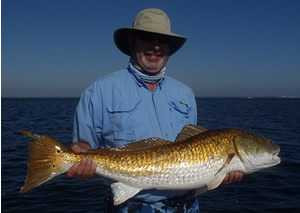 Micah's dad David Thomas with another impressive redfish on October 27. Jesse Quillen and John Brasher went looking for redfish a few days later along the same stretch of beach, but they were nowhere to be found. 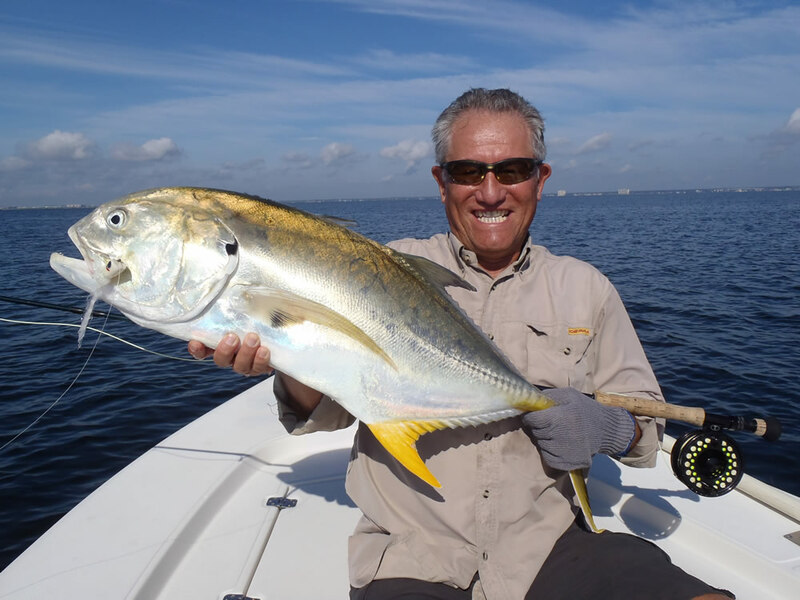 To our delight a late-season school of jack crevalle appeared travelling westbound, and we positioned the boat ahead of them and waited. 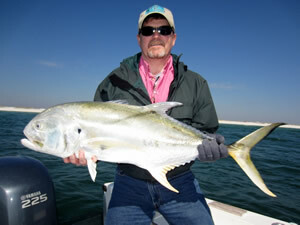 The fish were closing fast in their usual tight formation, and Jesse got his chug bug in front of the approaching school. 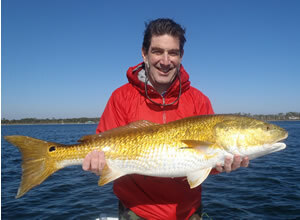 As he worked the plug this fish exploded on it and headed for New Orleans. 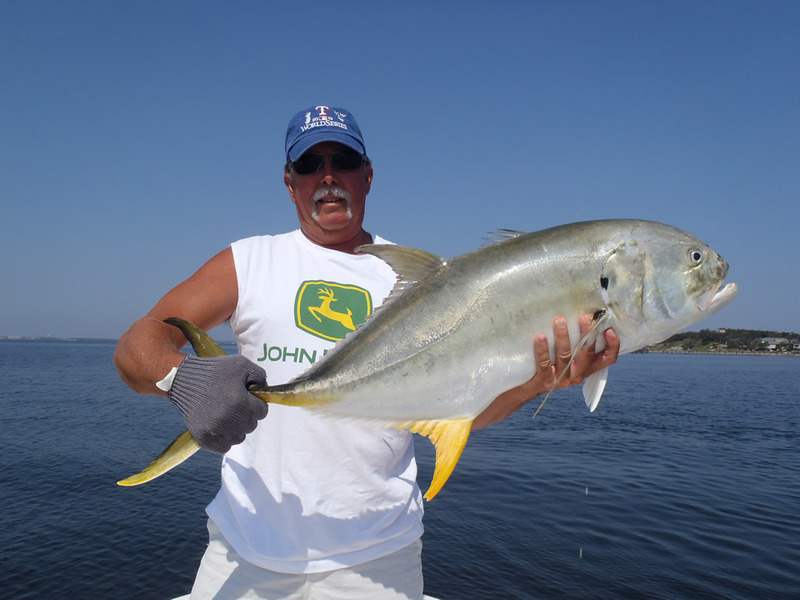 Jesse's first-ever jack crevalle on October 31. 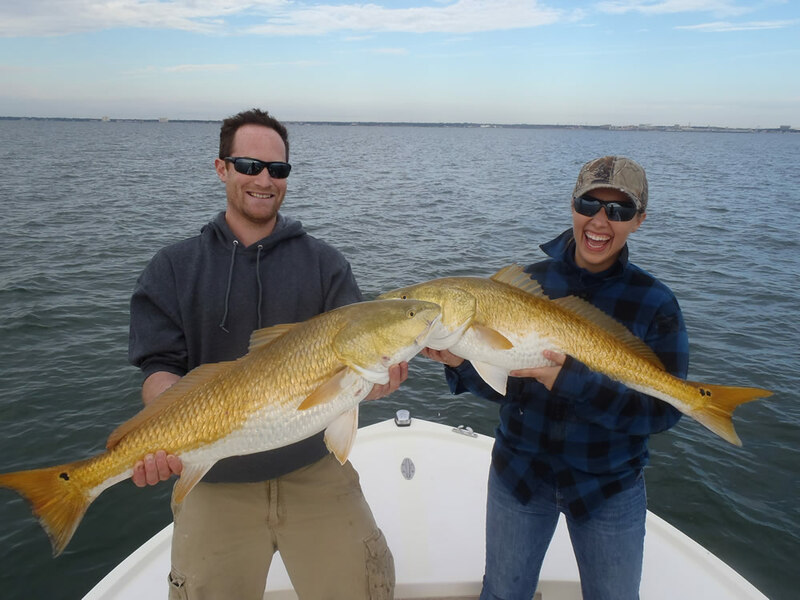 Jesse and John wanted to take a few redfish fillets home, so later in the day we drifted live shrimp around a deep-water dock in Santa Rosa Sound. 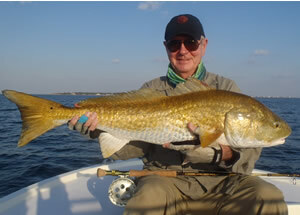 The redfish "slot" in Florida is 18-27", and this fish fell right in the middle. 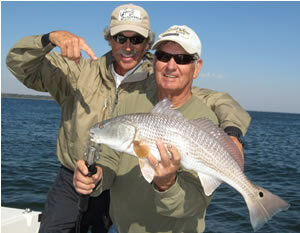 Jesse had the hot hand that day, but John Brasher got his mojo going late in the trip. 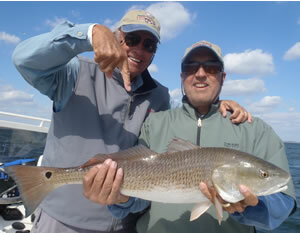 Here's Capt Baz and John having fun with his first slot-sized fish. Take that Jesse! 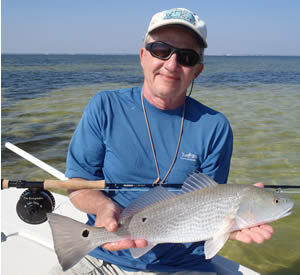 Dave Walters on Nov 2 with an adorable redfish taken on an EP clouser along the edge of the grass bed in the background. 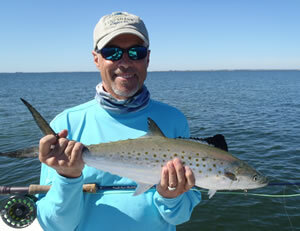 Check out the blue in the tail of this healthy fish which we released unharmed. 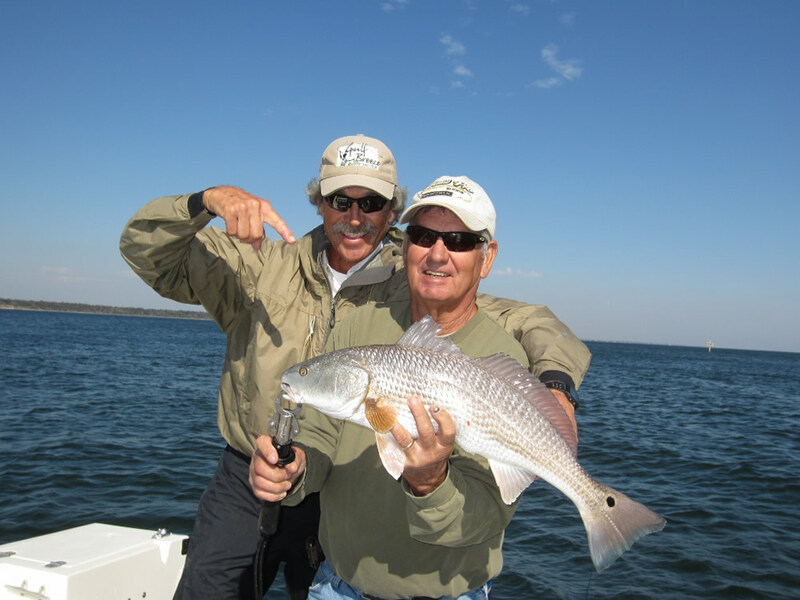 Brothers Don and Butch Joyner came to town on November 7 looking for redfish action. We tried all the usual spots and finally found good numbers of fish around the wreck of the WWI battleship USS Massachusetts 1.3 miles out from Pensacola Pass. Here's Don with the first redfish caught on ultra-light spinning tackle and a SPRO bucktail jig. 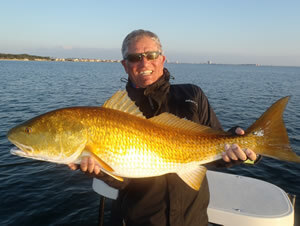 And a little later Butch took it to another level by landing this monster after a 30 minute battle. 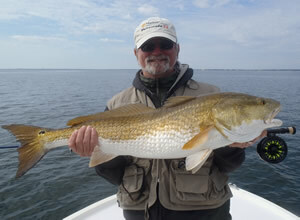 Good job Butch...biggest fish of the day! 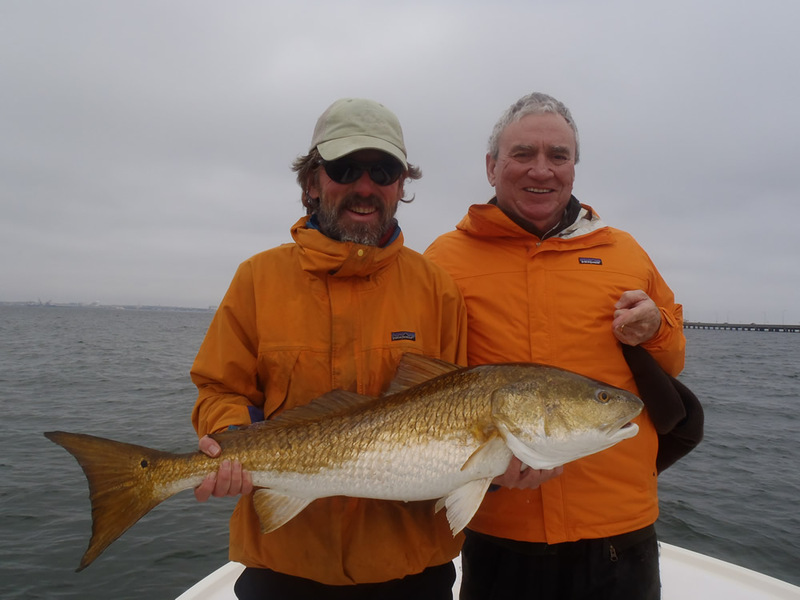 Mike Shields was in town on November 8, and his dad Russ booked a day hoping to find the redfish on top. 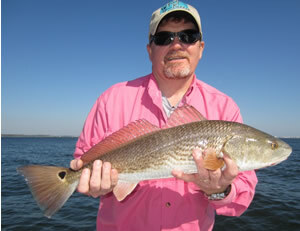 And man did the redfish ever cooperate... Mike landed 14 fish of this quality. Double click on the photo for a larger image of Mike and another redfish. Ah yes! Love it when a plan comes together. Hutch with the results of his efforts...a solid 5-6 pounder! 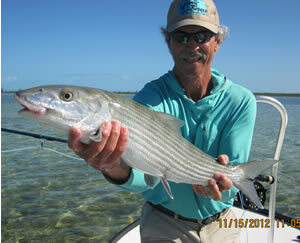 The bonefishing at Water Cay was terrific with fish averaging 4 pounds and numerous 10 fish days. The guides are excellent, and the Silvertail Lodge is reasonably priced, easily accessible, and comfortable with outstanding Bahamian-style home cooking! 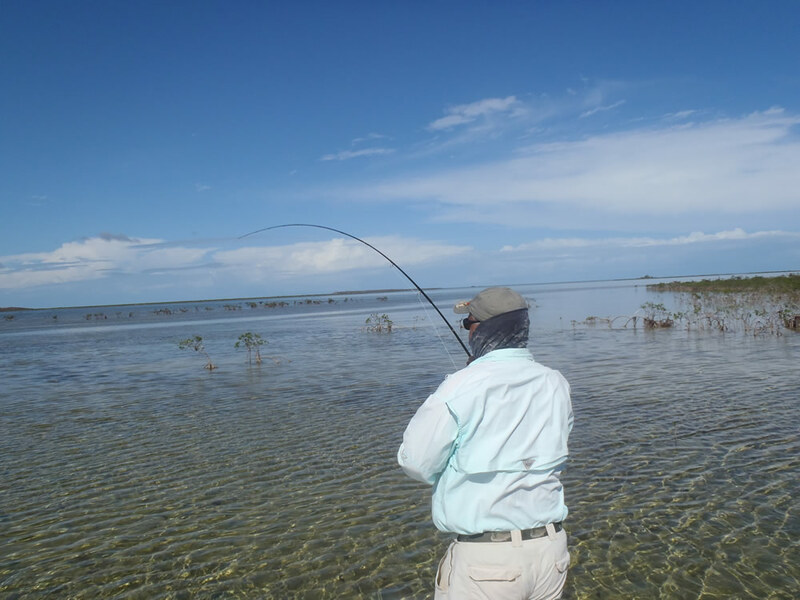 You fly into Freeport on Grand Bahama Island where the lodge staff picks you up and drives you to the waiting skiffs which transport you to the lodge. The lodge accommodates 6 anglers max per week. We booked the whole place for the 4 of us and had a ball. 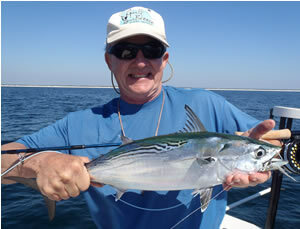 Here's Capt Baz with his best fish of the week. 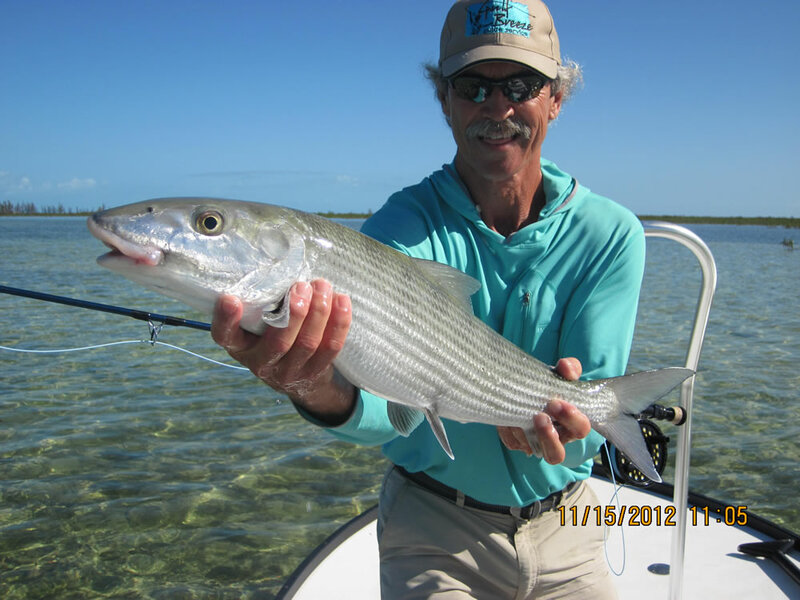 Baz's buddy Rocket Man posted this short Youtube video from the trip: http://vimeo.com/54199841 If you're interested in a perfect bonefishing experience contact Capt Baz for the inside scoop on Water Cay. 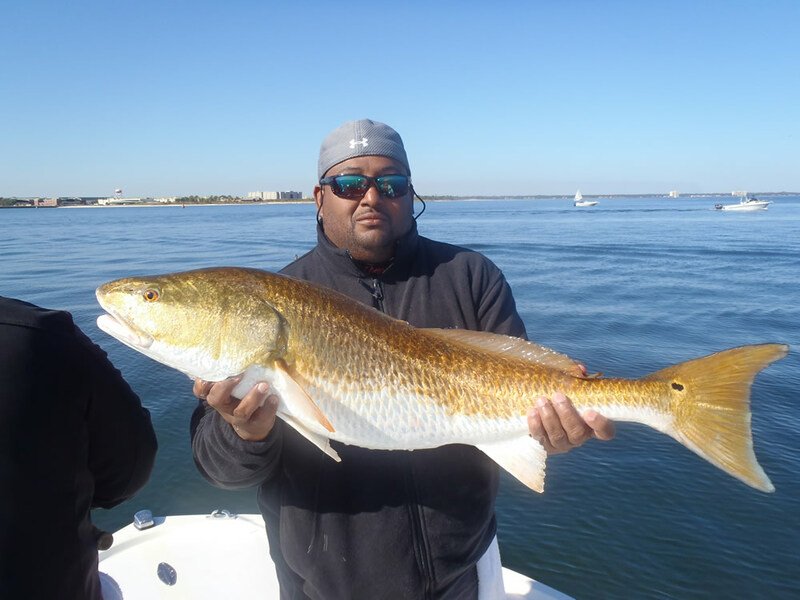 It took us a while to find them on November 18, but the redfish finally put on a show for Gerald McGee and Andre Harris. 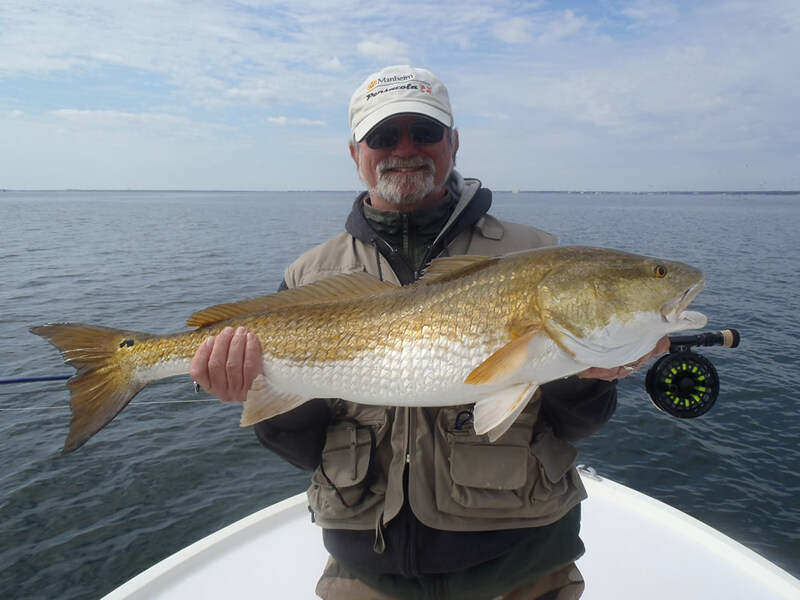 Here's Gerald with a "lit-up" bull redfish after we found them striking the surface on a glassy-calm afternoon in Pensacola Bay. 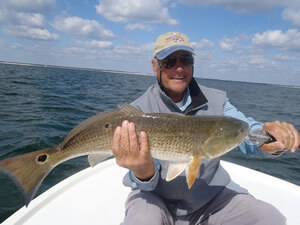 Double click on the photo for a full-size shot of Gerald and another redfish. 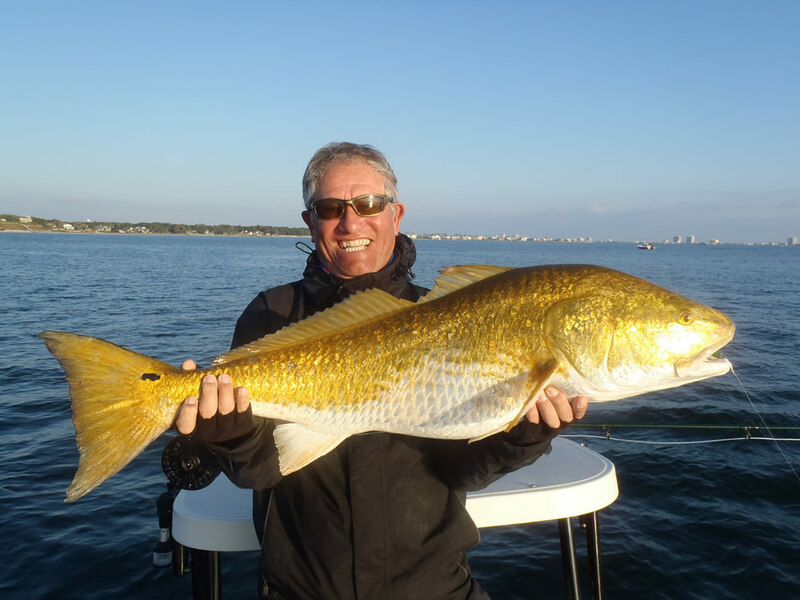 We started off November 19 catching a dozen or so slot-sized redfish around the docks in Santa Rosa Sound and then went looking for the "big boys"... which we found in Pensacola Bay by Muscogee Wharf. 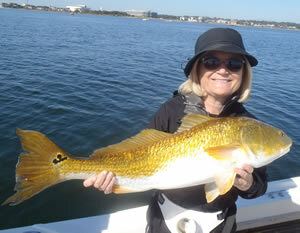 This is Jo Pease with the first big fish of the day. As did Beverly's husband Charlie Titlow. 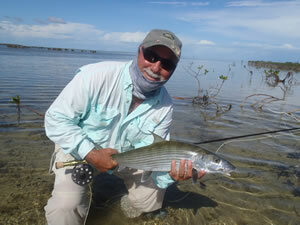 And then we cleared the decks for Jo's husband Tim English to get after them with the fly rod. 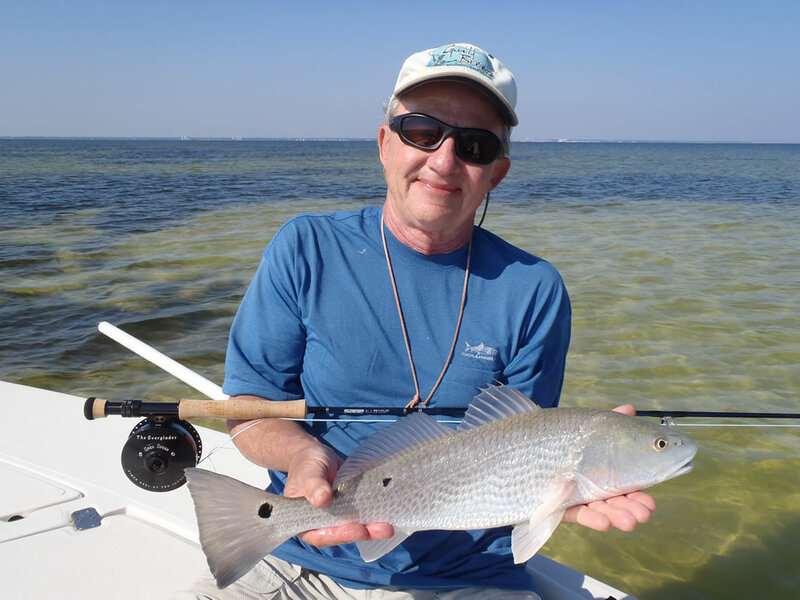 Tim was using a 9wt Sage Xi3 with a 250gr sinking line to get the fly down to the fish which were close to the bottom in 20' of water. 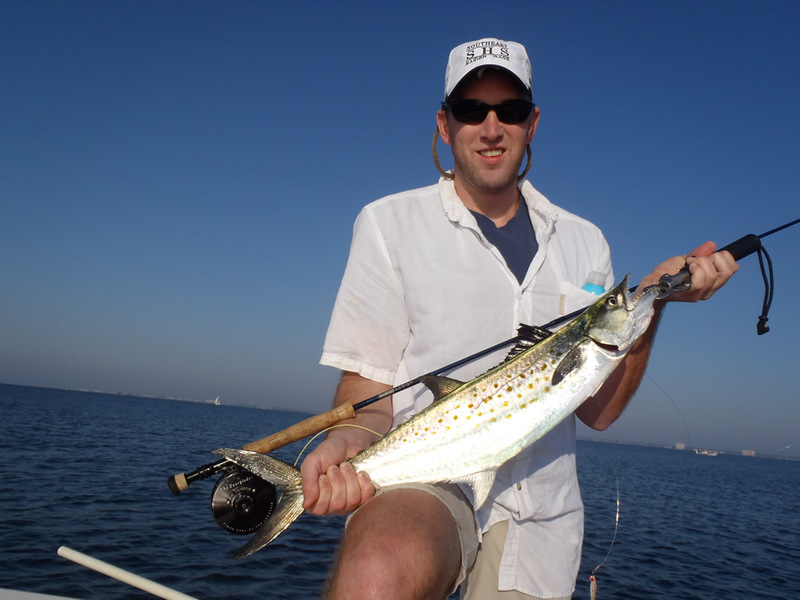 The fly was our "old faithful" green/white go-meaux from Deep South Outfitters, Birmingham, AL. 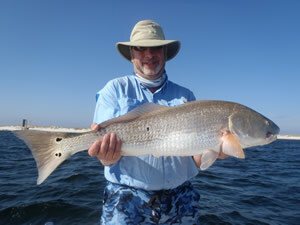 November 20 was a breakthrough day for Jay Brykczynski shown here with his first bull redfish on fly. 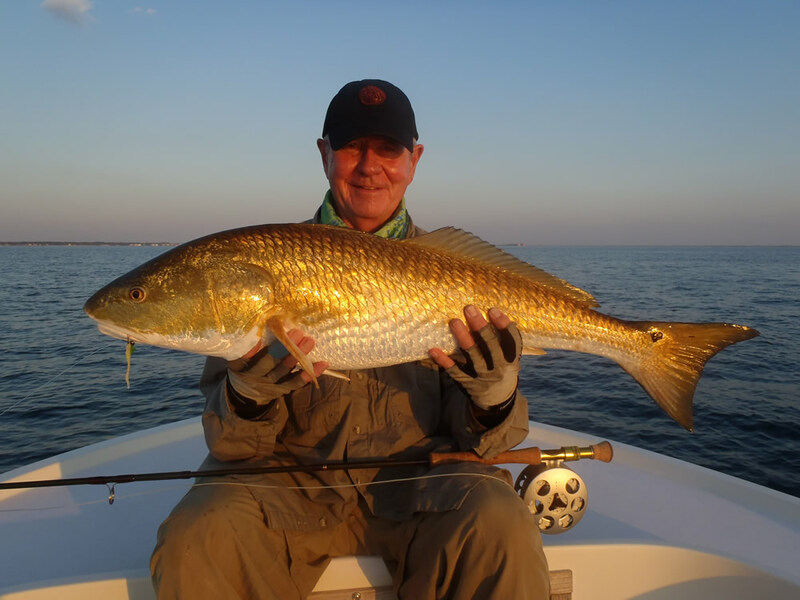 We knew there were redfish in the area, and Jay was blind-casting dredging the bottom with a 250gr sinking line and a 2/0 go-meaux. Suddenly he yelled "I'm on...I'm on! 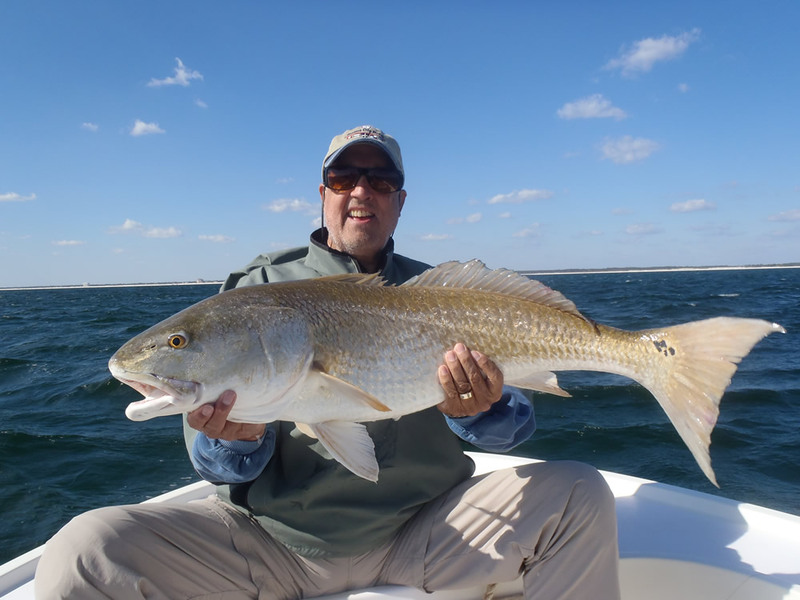 ", and we turned to see his 9wt totally bowed up. Way to go, Jay!! 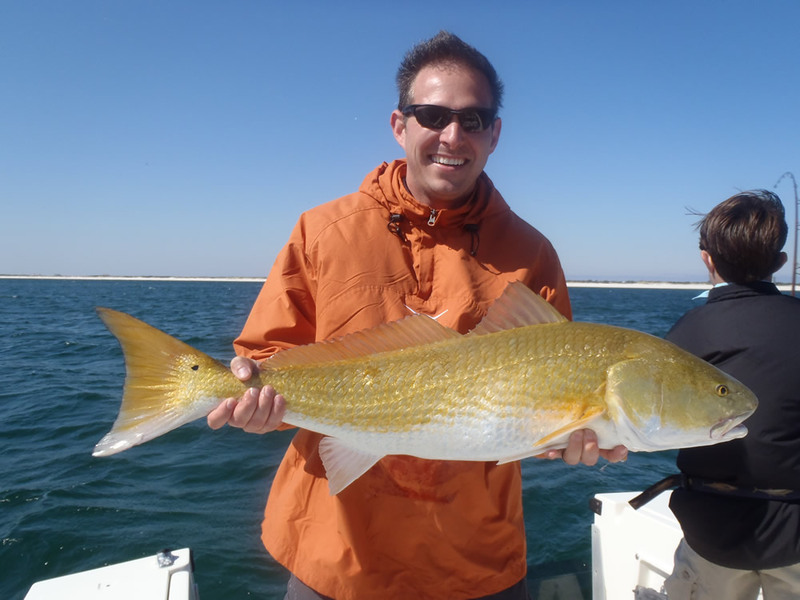 On November 21 we'd spent the whole day looking for the doggone redfish on top with zero results. It was about 3:30...6 1/2hr into a 6hr trip...and we decided to make one final turn through the bay en route to the Navy Point boat ramp. 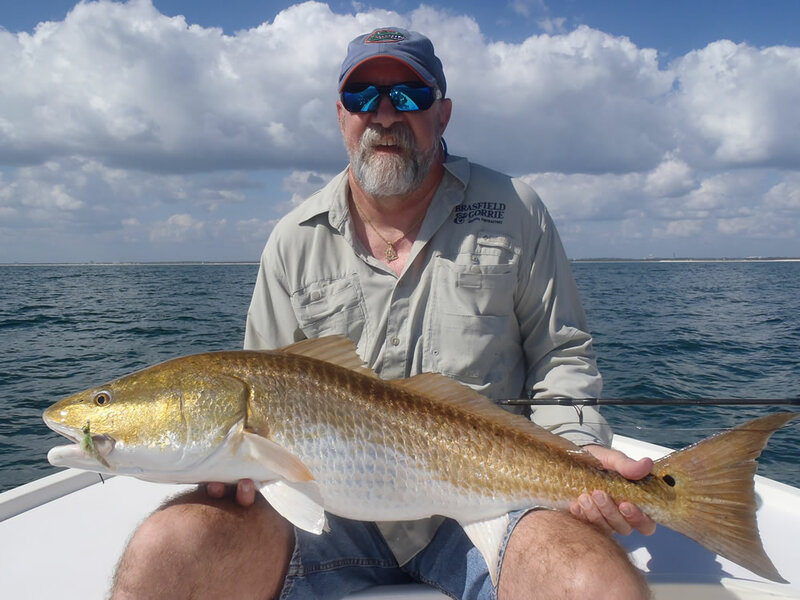 We saw some birds south of Buoy 22, ran over there, and to our delight the surface was exploding all around us as a huge school of bull redfish crashed baitfish. 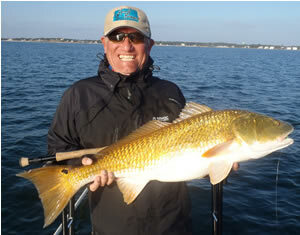 Cowboy Shireman was of course ready in a big way and landed fish after fish on his 10wt. Here's a shot of the first one he brought to the net. 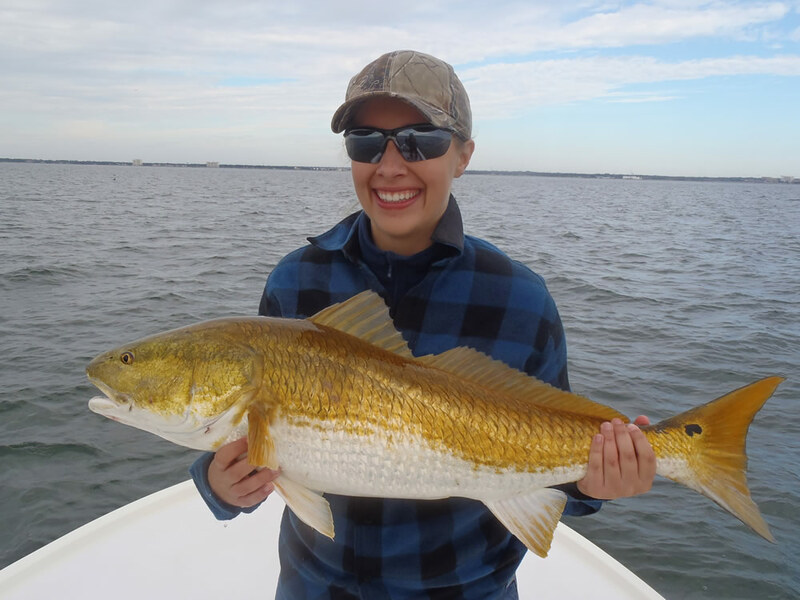 We released all the redfish without bringing them into the boat, but this fish was so beautiful we just had to have a picture. 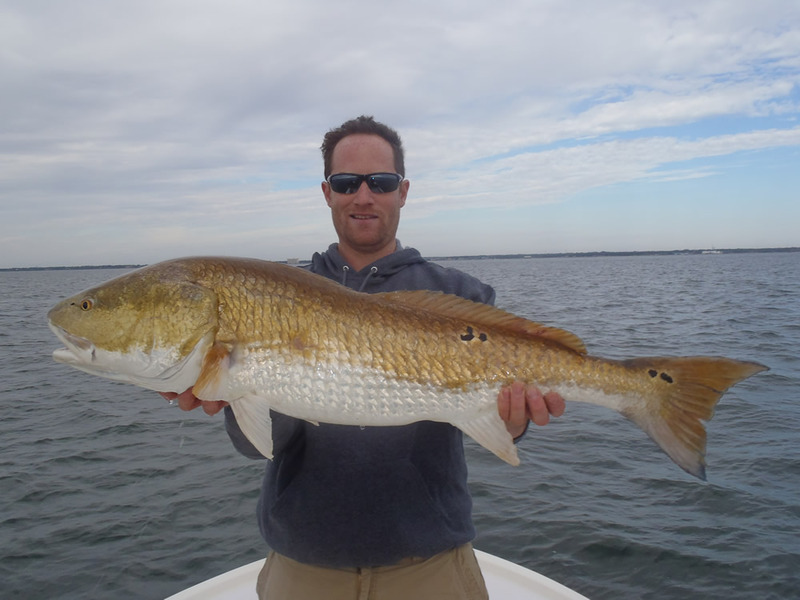 How about THAT for a bull redfish! There was no flash...the fish is reflecting the setting sun. Magnificent! 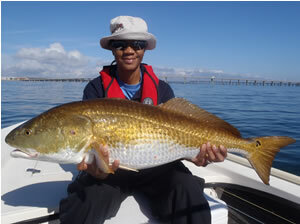 The motto of the story is when the fishing gets tough you just keep on fishing. Chances are something good will happen . November 23 was a frustrating day. 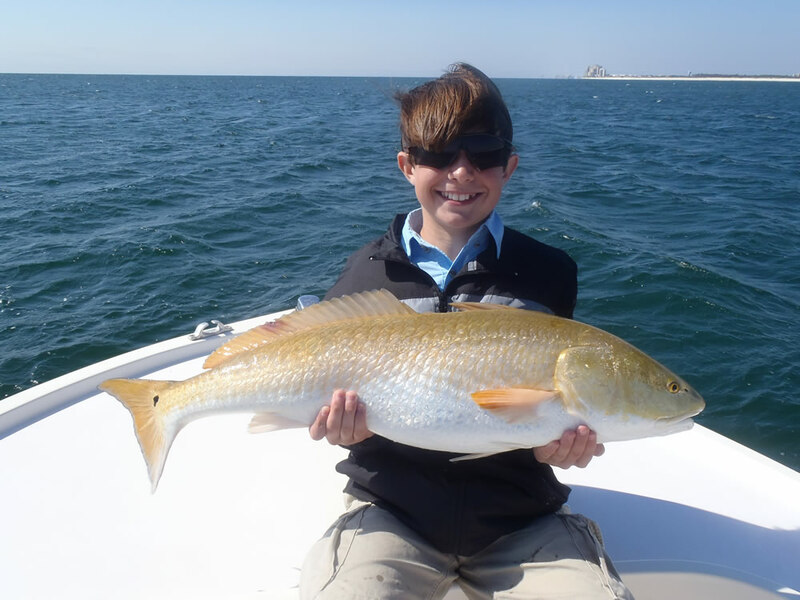 This young man Bryson Storie from Tennessee was one of the finest casters ever on the boat, and we couldn't find the big redfish. They were simply gone. We were in the Mako, so we couldn't pole the flats. Instead we got in as close to shore as possible and let the light westerly breeze drift us over our favorite flats...dropping the anchor from time-to-time trying to be as quite as possible. 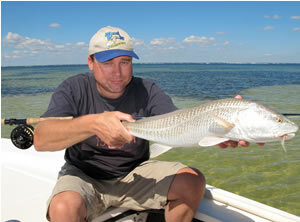 Sure enough there were a few slot reds on the sand flats, but they were nearly impossible to see. Check out the colors on this fish. 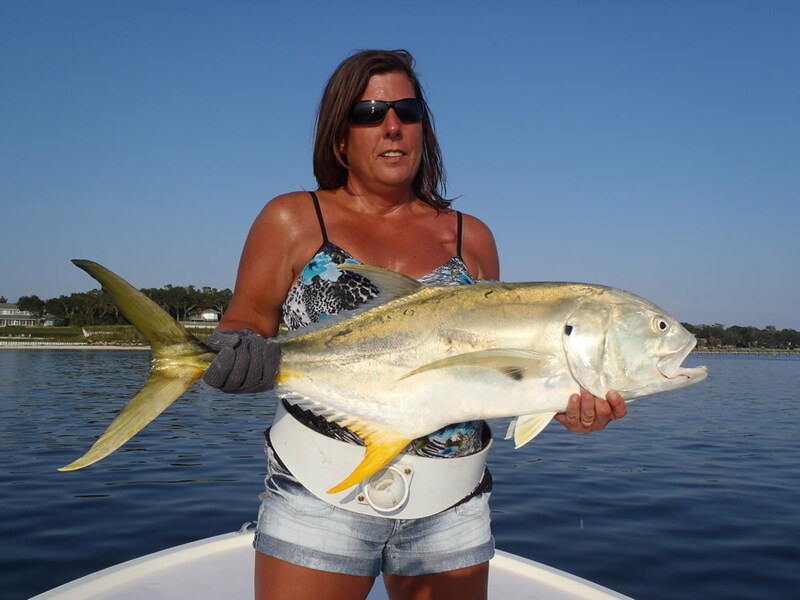 It's almost silver to match the sandy bottom. 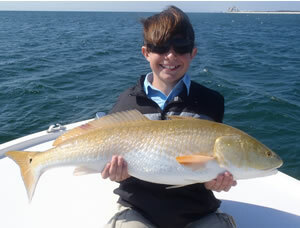 Cool thing was this kid could not only cast, but he could also see the fish. 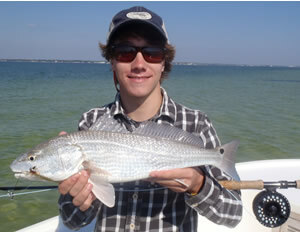 Bryson had the thrill of watching this fine slot-redfish swim into range, follow the fly, and then eat it. Of course he had made a perfect cast. Good job, Bryson. 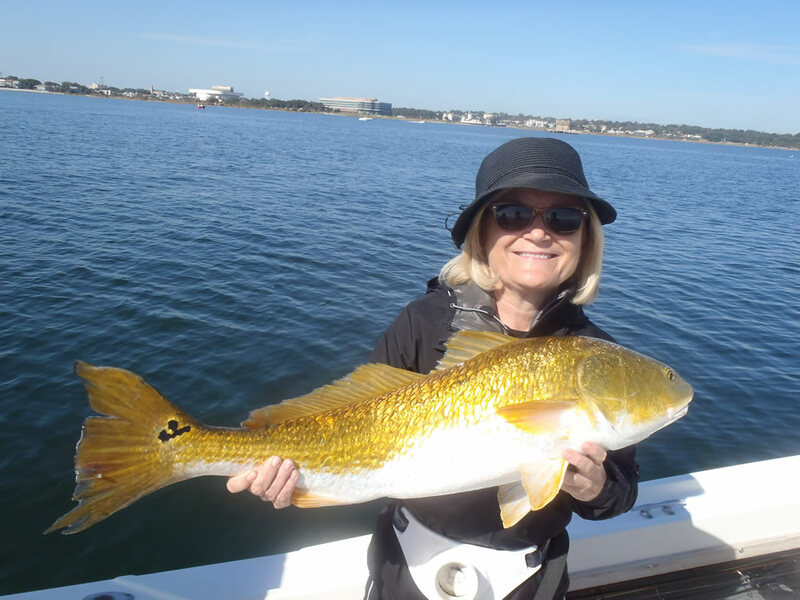 A few days later on November 26 the bull redfish were once again active which was exactly what Heather Trumbull and Jake Tessler had in mind. 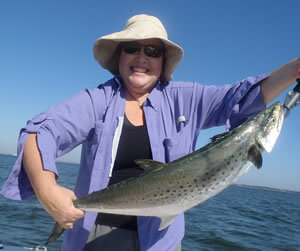 Heather boated the first fish while Jake was hooked up. 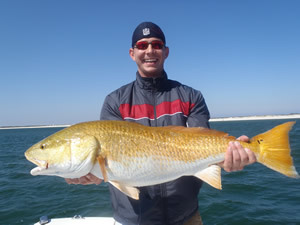 Here's Jake with one of the biggest fish of the day. And a nice double! 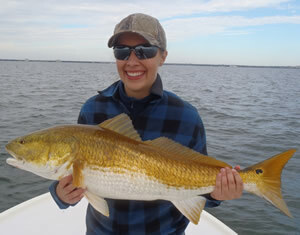 Heather and Jake had a blast that day landing and releasing about 500 pounds of redfish. 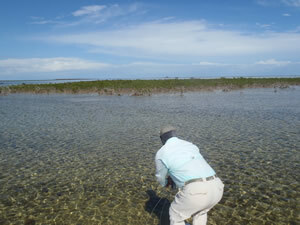 After taking pictures of the first few we started releasing the fish without taking them out of the water. 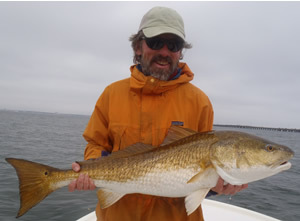 These magnificent redfish are our breed stock, and we make every effort to not harm them. 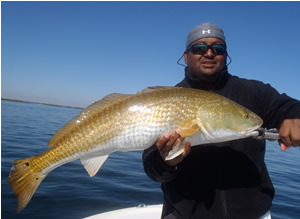 We use an 8" "Swirl Tail Grub" from Bass Pro Shops with a 1 1/2oz Owner jig head. The jig head has a 7/0 hook, and we mash the barb down. 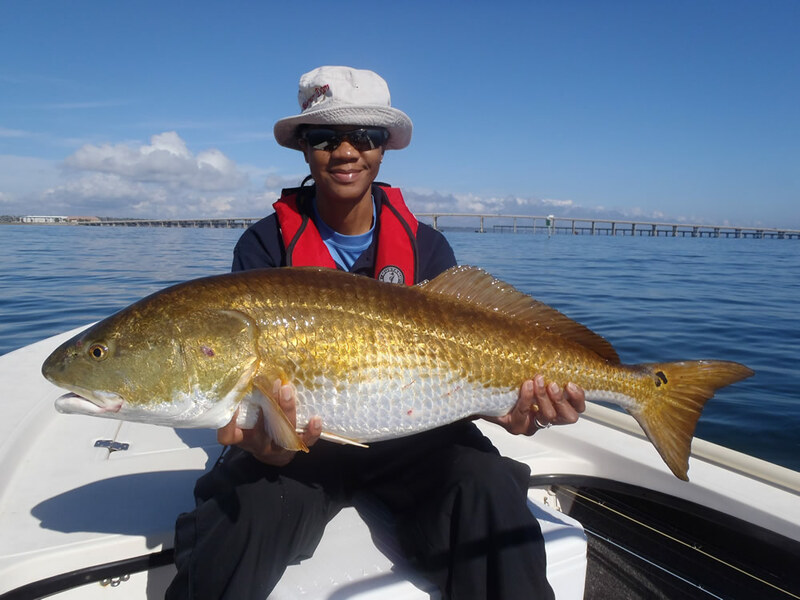 The bait is so big the fish can't swallow it, and the barbless hook is usually very easy to remove. 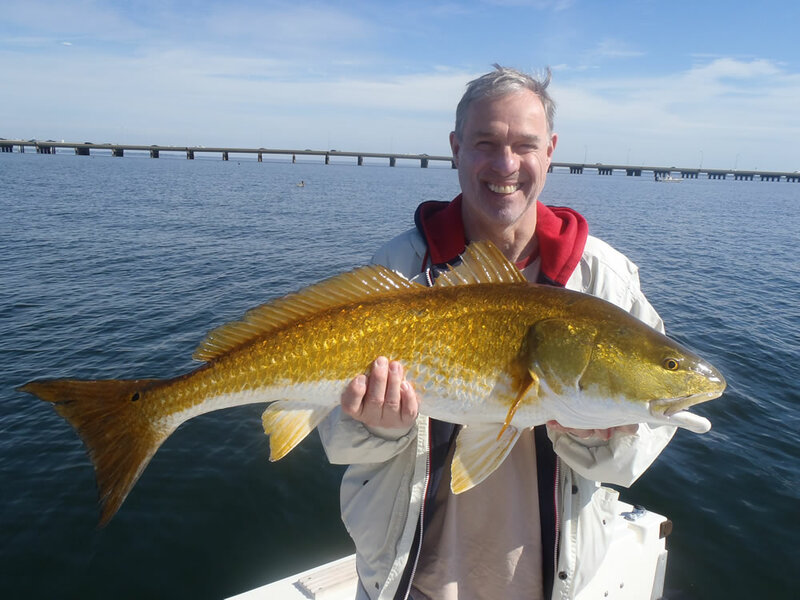 Before ending the trip we drifted cut menhaden over some of our favorite spots in Pensacola Bay hoping for a big grouper or red snapper bite. 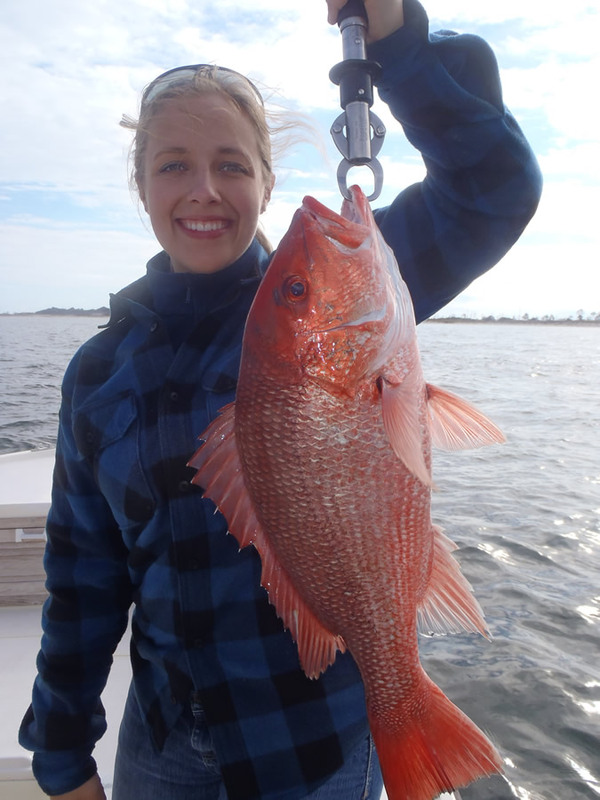 Heather had her hands full with this beautiful snapper which we released....closed season. 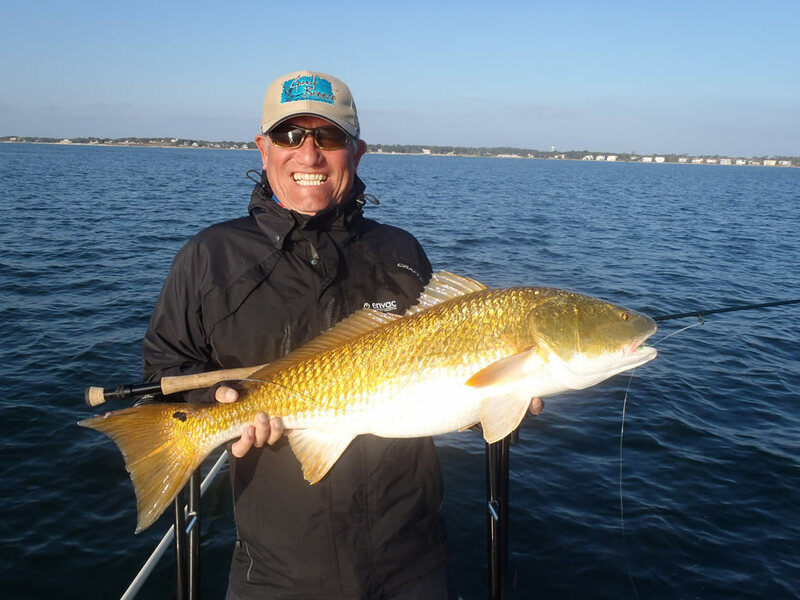 Mike Youkee was back in town November 28 hoping to get lucky with the big redfish, but we started off the trip looking for false albacore. 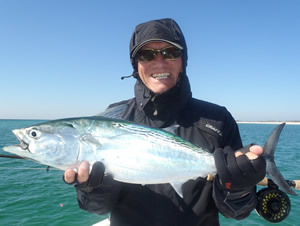 We finally found them east of the Pensacola Beach Pier...a long run but well worth the effort. 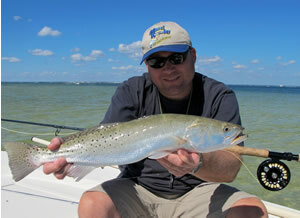 This fish took a sz 6 gummy minnow. 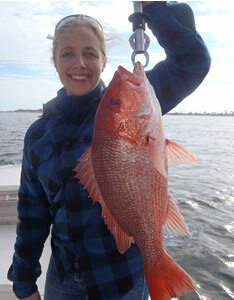 We looked hard for the reds and found them on the surface late in the day in the middle of Pensacola Bay. 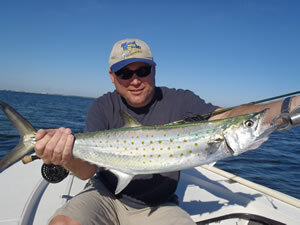 Mike caught this fish using a sinking line and a big streamer. 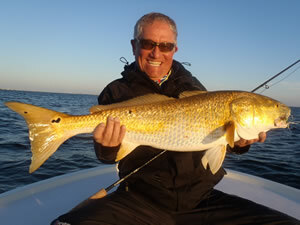 The following day we hit the mother lode close to Deer Point, and Mike landed numerous fish on his 10wt. 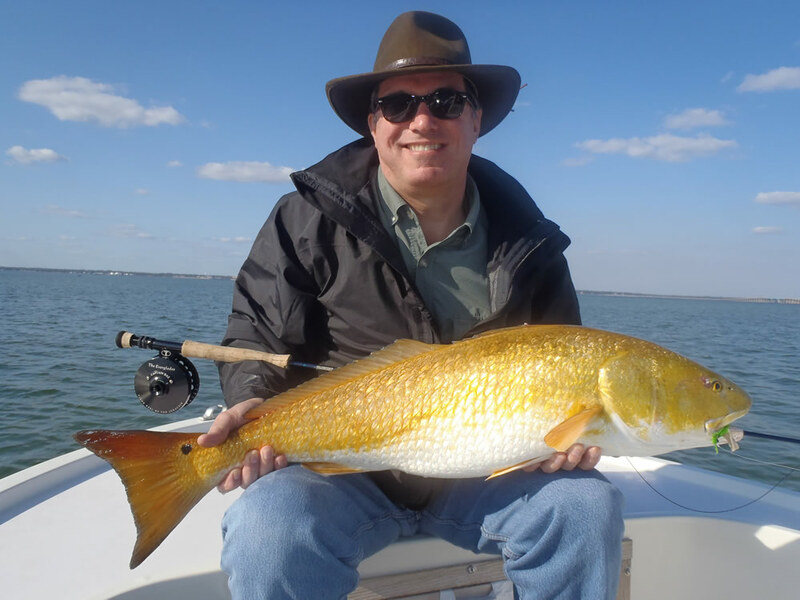 Nice hat...great fish! Take your pick between this photo and the next. 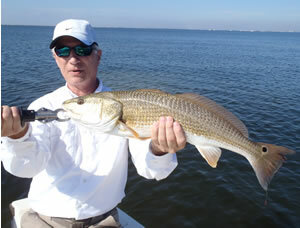 Hard pressed to find more beautiful redfish. Check out the girth! 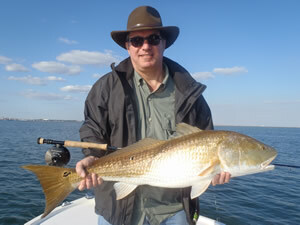 Here's Mike with the last redfish of the day as the sun was starting to set. It was a fitting ending to an outstanding day. Cocktail time! We had wind, rain, and high seas for the next week. 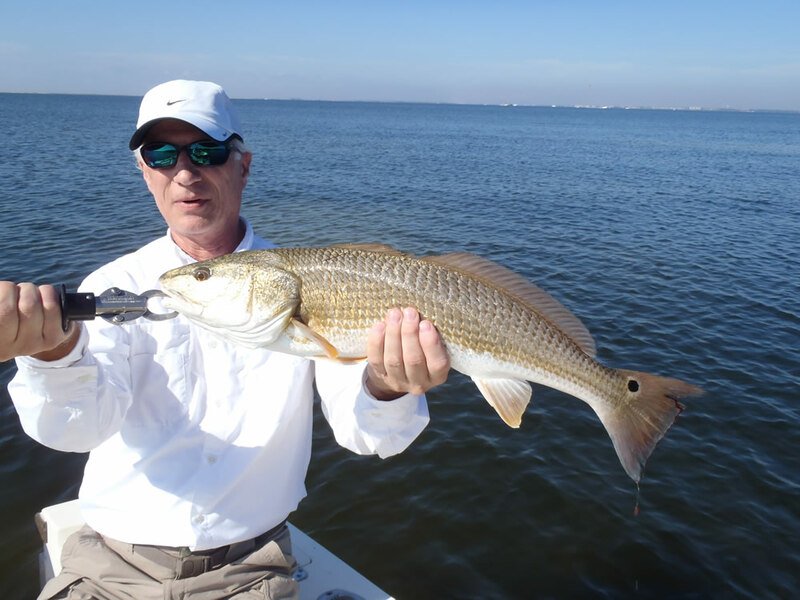 When Lyle Dean got here December 7 from Castle Rock, Utah, the schools of big redfish were nowhere to be found. At least all the fish weren't gone. 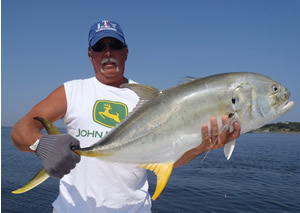 Lyle found the catch of the day under some pelicans around the mouth of Hoffman Bayou. 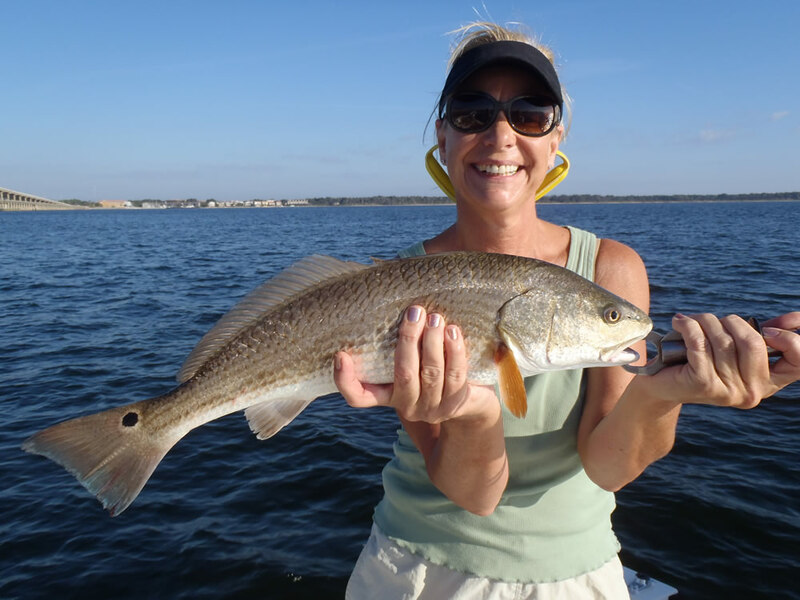 We end the fall gallery with Birmingham veterinarian Dr. Nikki Hamilton-Cox and a monster redfish landed and released December 8 in Santa Rosa Sound. 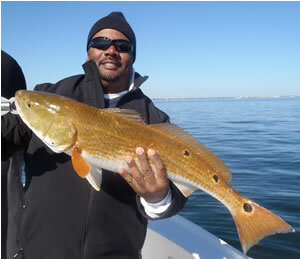 Beautiful day...beautiful fish.